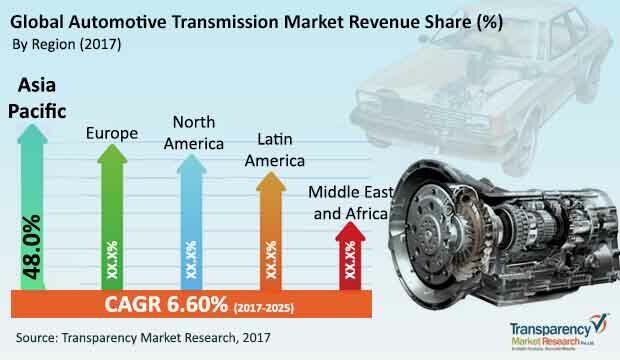 The global automotive transmission market is largely consolidated in terms of its vendor landscape, partly owing to the presence of very few manufacturers that solely operate in the field and the preference of several leading auto-makers to in-house manufacturing of transmission systems in collaboration with some tier-I companies, observes Transparency Market Research in a recent report. This has led to a scenario wherein other transmission system manufacturers are left with very little scope of expansion. For sustainable returns, companies could benefit from strategic alliances with leading auto-makers. Some of the leading players in the market are Eaton Corporation, Continental AG, Allison Transmission, ZF Friedrichshafen AG, Borg Warner, Magana International Inc., JATCO, and Aisin Seiki. According to the report, the global automotive transmission market was valued at US$30.02 bn in 2016 and is projected to rise to US$53.20 bn by 2025, registering a CAGR of 6.6% from 2017 to 2025. In terms of the type of transmission chiefly used in automobiles, namely manual and automatic, the segment of manual transmission is presently the clear leader. Low cost of vehicles with manual transmission, well-established market for manual transmission vehicles, and lack of awareness among consumers regarding the vast benefits of automatic transmission have worked in favor of the manual transmission segment so far. Geographically, the rising uptake of passenger vehicles across emerging economies such as India and China, the market for automotive transmission in Asia Pacific is likely to emerge as the most lucrative one. The market in North America is also expected to exhibit a promising pace of expansion owing to the demand for vehicles with advanced transmission systems. While the continuous rise in demand for passenger vehicles across emerging economies forms the central factor driving the steady expansion of the market, a number of factors are also leading to vast changes in the way the market is developing. Factors such as changing preferences of consumers in terms of vehicle performance, the need for improved fuel economy of vehicles, and higher power requirements are pushing automotive companies and transmission system manufacturers to invest more in research and development activities. Moreover, automobile manufacturers are also continuously undertaking research efforts to improve vehicle performance so as to reduce transmission power response time and meet carbon emission norms. The scenario has resulted in the development of technologically advanced products such as continuous variable transmission (CVTs), 9-speed automatic transmission, and dual shafts gearboxes (DSG). The increased demand for automatic transmission in entry-level vehicles, especially across emerging economies such as India, Brazil, and Mexico owing to the added convenience and comfort offered by automatic transmission, is also working in favor of the market. The market struggles to exploit its full potential across regional markets that feature consumer that lack the awareness regarding the vast benefits of advanced transmission systems and are highly sensitive regarding the cost of advanced vehicles. Several economies with a thriving automotive industry due to the rising disposable incomes and increased uptake of passenger vehicles, such as India, China, Mexico, and Brazil, still showcase the dominance of vehicles boasting manual transmission. While lack of awareness is largely attributable for this scenario, the high cost of vehicles with advanced transmission systems also plays a notable role.